If you don’t know you are in a relay race, how do you know when to take the baton? When it comes to the discussion of race and sport around the globe, author and columnist Bill Rhoden says that older generation of African-Americans need to continue to educate the younger generation to continue fighting for equality. 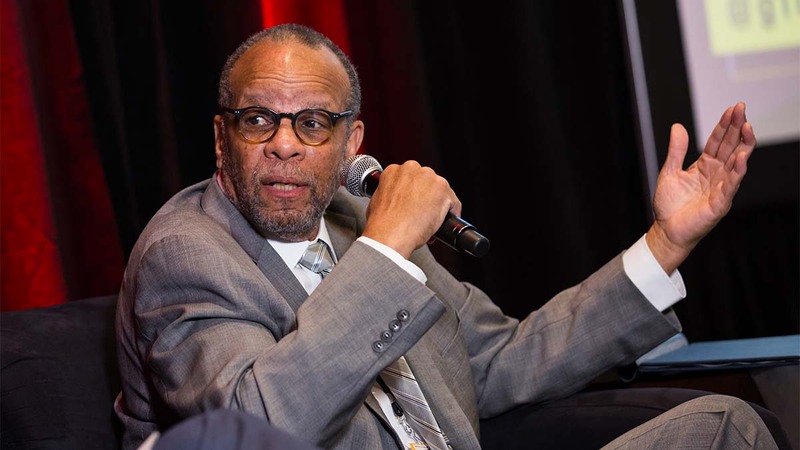 Author and columnist Bill Rhoden says the younger generation of African-Americans – athletes and non-athletes – need to make the transition into positions where they can affect change such as in sports media, the board room and other leadership positions. Rhoden said at the Global Sport Summit in Phoenix in late March. In his book, Rhoden wrote the younger generation of athletes aren’t prepared for today’s racial realities in America. He reiterated that notion at the summit, saying younger people don’t realize how much black athletes had to fight for representation in the major sports leagues. “If you are a young person, and you have no idea of the struggle that came before you, then you don’t think there is anything to fight for,” Rhoden said. Rhoden said he was not shocked by what was taking place on the field, but what was happening in the press box. Even though sports have grown when it comes to race, journalism lags. According to The Institute for Diversity and Ethics in Sports, roughly 18 percent of journalists are people of color. Rhoden said those statistics are disappointing, but persistent. He encouraged those who would do the hiring to realize they aren’t doing their outlet a favor by not hiring a diverse staff. “The change we’re talking about could come from people with the right minds,” Rhoden said. Since Rhoden joined ESPN’s The Undefeated in 2017, he has given such opportunities to new journalists through his program called “Rhoden Fellows.” Rhoden Fellows are chosen from historically black colleges to write and produce content for The Undefeated in a yearlong paid internship. What shocked Rhoden most was what he called the work from the invisible industry: those who work behind the scenes at sporting events in departments like game day production and members of the television crew. That part of the sports world is predominantly white. So he pushes Rhoden Fellows to partake in those capacities as well. Rhoden said as long as they push equality for all races and genders, they should focus on doing the right thing by giving everyone an equal chance in all types of fields. According to TIDES, African-American athletes have increased as a percentage of participants in major sports across America with 74 percent in the NBA, 69 percent in the NFL and 8 percent in MLB. Though those numbers are significant, they can’t be justified unless black athletes use that to their benefit according to Rhoden. “What does that mean if your organization is still 99 percent white” Rhoden said. He challenged black athletes to take a step back and analyze the teams they are playing for. “See how many people there look like you, and then let me know what that says about you,” Rhoden said. Today, athletes are recruited to top universities with a goal of playing professionally. Rhoden said if those athletes don’t see themselves pursuing their education after eight months, they should give their scholarships to those black students who couldn’t afford the tuition at these top schools. He challenges these next stars in the sports world to gather the courage to break the cycle of scholarships falling by the wayside with the one-and-done policy. Those athletes leave with leverage, and they should support other people of color to pursue their dreams too. “It is up to someone next to Zion (Williamson) and these guys to realize that it is just not about you,” Rhoden said. Rhoden went on to say that since the one-and-done rule was implemented in 2005, Rhoden sees the opportunity these athletes were leaving behind with their unused scholarship money for school. Athletes on the professional level have been more open with their pursuit of change. Rhoden wrote in his book that pro stars have never been more disconnected from their community, but he acknowledges the situation has started to change since the book was first published. He stated black athletes have realized if they weren’t wearing a jersey, they would face the problems African-Americans go through on a daily basis. “These players realized that with all the young people getting shot, that could be me,” Rhoden said. Corey Kirk is a masters sports journalism student at Arizona State University. CORRECTION: An earlier version of this story misstated the number of African-American or black players in the NBA and NFL according to the latest TIDES report.